The Louisiana oil spill has been officially declared as the worst oil spill in history of the United States. Unlike most such accidents, which are usually caused by an oil tank being damaged, the leak generated by the BP platform explosion seems unstoppable. 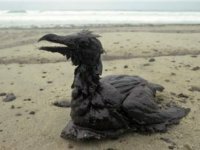 And while accusations and solutions are trying to make sense out of this controversial case, thousands of birds and sea animals die suffocated by the oil layer.